According to indigenous wisdom, the White Lions’ arrival at this particular moment in time and in this particular location is not coincidental. Indigenous people across the globe believe that everything in nature happens for a reason, and it is significant to note that the prophecies surrounding the White Lions correspond with the beliefs of ancient cultures on other continents. In fact, Zulu shamans and other African elders view the White Lions’ arrival in the wilderness as the fulfillment of an ancient prophecy, identifying these majestic creatures as "angelic messengers from God." African elders believe that the White Lions are the most sacred animals on the African continent and are here to deliver a sacred message for humanity during these times of great crisis. 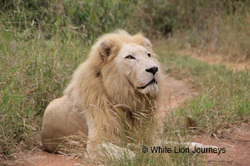 As an apex predator, the lion is viewed as the true guardian of the land; the White Lion, in particular, is believed to be the "King of Kings," an angelic guardian presiding over this sacred site, who has a a vital role in the sensitive ecology of this region and beyond. For many centuries, African kings identified the lands of Timbavati as a protected area. It falls on the Nile meridian (31 degrees East), a ley line which is also referred to as "Zep Tepi," believed to be the spot at which life first emerged on the planet. This area also happens to be exactly aligned with the great Sphinx of ancient Egypt, a representation of the fusion of human beings and lions, both considered to be at the apex of their respective kingdoms. Whether one believes in these legends or not, when in the presence of the White Lions, one cannot dispute that they are both majestic, and some would even say, magical. And spending time with them on their homelands of Timbavati is truly an unforgettable, life-changing experience.